Here is a picture of a white chocolate rose dusted with gold powder that I made recently for a Bridal Shower. I have other pictures I would like to share that I have done for Baby Showers, holidays, etc. 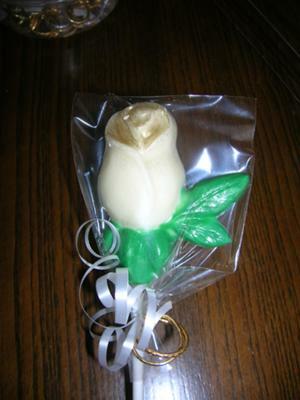 The chocolate molded white rose is gorgeous. You really do nice work. We'd love to have you share as many of your photos as you like. I'm in the process of working on making it possible for people like you to advertise your chocolate creations for sale here at chocolate-candy-mall.com. It's a bit tricky on the programming side (beyond my technical skills) but I'm hiring a programmer to make it possible. Hopefully that will be something you and several others will be interested in taking part in. I'm happy to recommend the top chocolate candy sellers, but I think many visitors would love to purchase homemade and personally designed favors, etc. I can't predict yet how soon this feature will be available, but hopefully in the next couple of months. Meanwhile, you can whet our appetite by sharing other baby and bridal shower favors that you've made. I painted the mold first making sure it had a thick coating. Hold it up to the light after you paint it to make sure you can't see through it. Then I pour the white chocolate into the rose mold, make sure you fill the entire mold, even over the green leaf part. Put in Refrigerator or Freezer. I use my freezer because it's quicker. Be careful when you unmold this because the leaf part isn't as strong as the rose part. I suggest putting a thick towel under the mold to release it. This is beautiful. I think there would be a market for such lovely favours as this but your guests must have been truly impressed to receive them. Good idea about making it possible for people to sell their goodies via your site, Angie: I hope it all works out for you.